It's time to do WAR ON THE FLOOR! 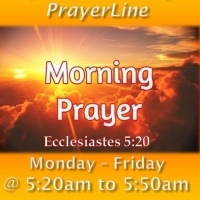 Join Pastor Marty and fellow prayer warriors for a half-hour of POWER, as we intercede for our families, churches, community and the nations in prayer, on our Rays Of Hope Morning Glory PrayerLine! Call 319.527-9177 Access Code 721306 That is every Monday-Friday morning from 5:20am to 5:50am! It's open to the public, so everyone is welcome to call in and touch and agree with us in faith believing GOD for great things to happen in our lives and others! If you have a prayer need/request you can send it via email to hopeforme.net@gmail.com and we will add it to our prayer list. Looking forward to you joining us at HIS throne of grace!